The setup - I had been just checking weather occasionally as I worked on various projects today, but a severe thunderstorm watch was out just to our north by late afternoon. The air mass remained quite unstable, but the instability was not accompanied by the amount of shear there had been yesterday, when CAPE of 3000-6000 and helicity of around 500 had produced sky-high energy-helicity indices in our area - and there was even a warm front draped over the area. But all that had gone to waste because of the cap. At least that was much weaker today, but most of the action looked to be to the north. A derecho initiated in Iowa and northern IL during the afternoon and screamed east through Chicago and later all the way to Pittsburgh. The watch was for the trailing end of this activity, so it looked like the main show would be to our north - though SPC had a moderate risk out almost as far southeast as our area. I had to drive in to my office around 3:00 with a few errands along the way, and as I did, I noticed a wind shift to the northwest and a few cumulus forming just to the south - probably an old front or an outflow boundary had just moved through - but the temperature stayed in the low 90s and very humid. I did check radar when I got to my office and the boundary showed up very well, alligned from ENE to WSW across the eastern and southern parts of the STL area. Since this boundary would be the first forcing mechanism the warm, moist air surging up from the south would encounter, I wondered if there might not be some strong storms that would go up along it. 4:30 - out the door. I heard a t-storm warning for a couple counties east when I got home, and could see that the tail-end storm, maybe 15-20 miles east, was looking good. So, I decided to go after them and see what I could see. I was under way around 4:30. 4:45 - The storms ahead are looking very good ahead, east of Highland, as I head down IL route 143 through Marine. Anvil sheared all directions and rock hard towers on W side of storm. I pick up I-70 and pursue the storms east. 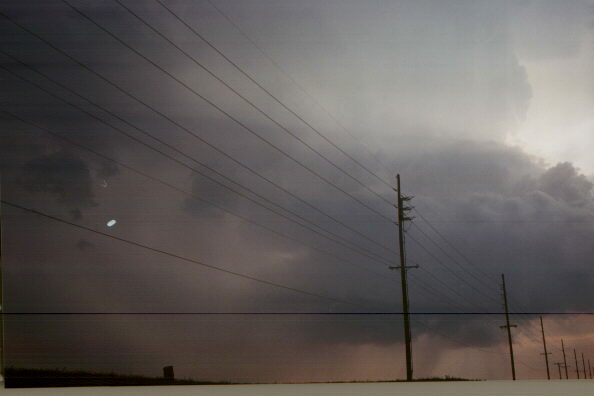 5:00 - I turn south on 127 at Greenville toward the updraft base, which is now to my south. The core is just to my SE. 5:15 I a reach the end of the road at Carlyle Lake after turning east on a country road a few miles south of I-70. As I head toward the lake, I encounter intermittend heavy rain, but the storm is showing signs of weakening. I see extensive ponding and a few leaves stripped from trees. When I get to the end I go north a mile or so and return back toward 127 on another country road. I then return to I-70 and head west toward Edwardsville, and continue to retrace my route, exiting 70 at route 143. I see anvils and towers of new storms to my southwest. 6:00 - When I get to route 4 just west of Marine, I see that new storms are also going up to my south. So, I head south on route 4 toward Lebanon. The new storms appear to be developing on the same boundary as the earlier storms. 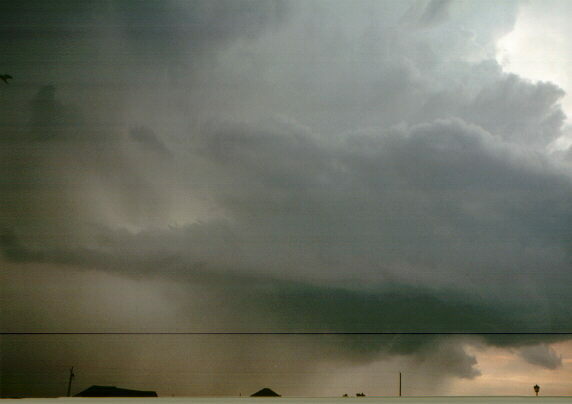 I see wall-cloud-like feature under one updraft SE of Lebanon..
6:10 - I view the storm 1 mi. east of Lebanon. There's not much precip or lightning - the storms almost have an LPish look to them. But now they don't seem to be doing much, so I start back toward home again. But as I do, I see ragged scud halfway to ground on a developing storm to the WSW. So, I continue through Lebanon and proceed west on U.S. route 50. 6:25 - After turning north on Troy-Scott Rd. 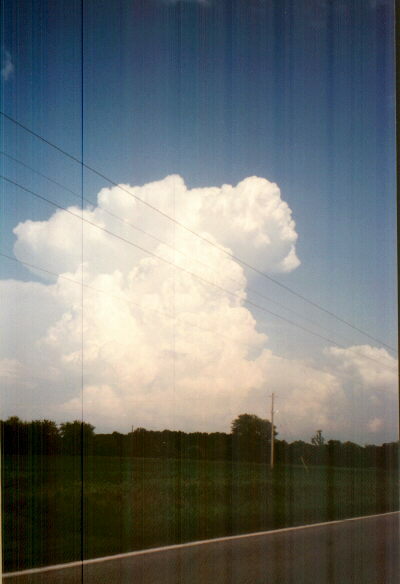 north of Scott AFB, I view the storm from the north edge of O'Fallon just west of Troy-Scott Rd. I see a nicely backlit storm start to go severe over Fairview Heights. 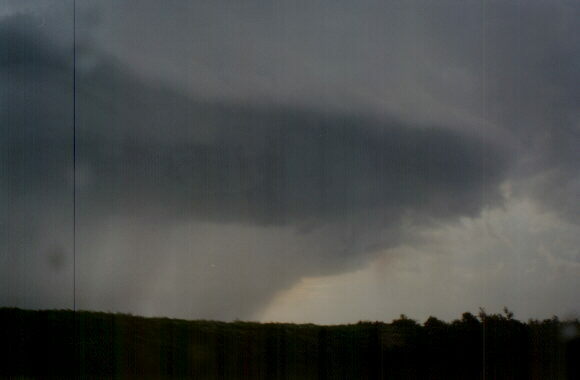 The storm structure has become spectacular: a round updraft base, a vault, rain/hail shafts, and a beavertail-like structure - all shown here. Along with this is lots of CG, and all of this is backlit by setting sun. 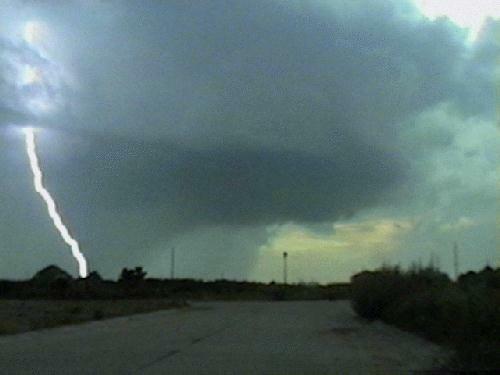 This video capture shows the round updraft base and backlit nature of the storm, along with a spectacular CG. It was more than worth the chase just for this 5 minutes! Not often do we get a severe storm this isolated and with such high contrast in southwest Illinois! 6:30 - The storm takes on almost a mothership appearance as it moves very close to my position. It's time to retreat as I'm about to be overrun by rain/hail core! The storm drops half-dollar size hail on Fairview Heights (about 3-4 miles WSW of my location) at about this time. 7:00 - Home. The chase ended about 7 miles from my house, so it was pretty convenient! Total chase distance: about 130 miles. Severe Thunderstorm Warning on this storm can be seen here. Severe Weather Statement on this storm can be seen here. Local Storm Reports on this storm can be seen here.